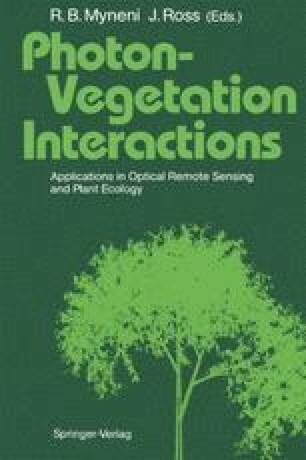 Mathematical modeling of the interaction of electromagnetic radiation with vegetation canopies is a research field that has been highly active in recent years. Modeling a canopy as a “turbid medium” of leaf and foliage elements in a slab geometry, the general equations of radiative transfer (Chandrasekhar 1950) have been approximated and solved in various ways and with varying types of description of the canopy. For example, both Suits (1972) and Verhoef (1984) use a four-stream approximation of the radiation flow and its interaction with canopy elements that has its origin in work by Schuster (1905) and Schwartzchild (1914). Cooper et al. (1982) and Kimes (1984) also use multistream approximations which, along with a variety of models for photon transport, are comprehensively reviewed in Myneni et al. (1989). In these models, the canopy elements are parameterized by such variables as the reflectance and transmittance of the leaf, leaf area index, and the leaf angle distribution. Many of these models are one-dimensional, in that the canopies vary only with height above the soil or ground surface.